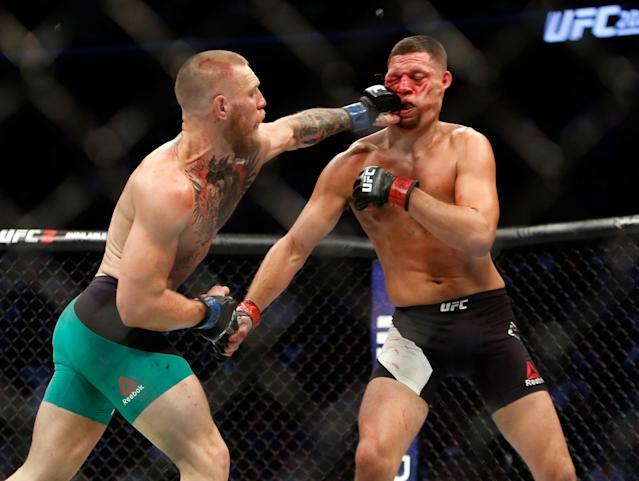 LAS VEGAS – Conor McGregor got his revenge, out-striking Nate Diaz in an epic welterweight battle at T-Mobile Arena in the main event of UFC 202, setting up a huge-money rubber match. McGregor won a majority decision, by scores of 48-47 twice and 47-47, in a classic battle in which McGregor scored three knockdowns in the first two rounds, but both men connected with telling blows. Yahoo Sports had it 48-47 for McGregor, giving him rounds one, two and four. “Surprise, surprise!” McGregor said immediately after the result was announced. “The King is back! If you want this trilogy, it’s on my terms. I came up to 170 [pounds], now you’ll come back to 155 and we’ll finish what we’ve started. Diaz submitted McGregor in the second round of a bout at UFC 196 in March, but McGregor used his striking on Saturday to pull out the win. He opened by firing kicks and then going upstairs with his hands, and he quickly opened a cut by Diaz’s right eye. He dumped Diaz once in the first and twice in the second, and by the time the first round was half over, Diaz’s right eye was swelling badly. Diaz, though, loves that type of fight, and began to land and rock McGregor in the third round. He had McGregor reeling at several points in the round, but McGregor steadied himself. Diaz thought he won the fight and threw his hands in the air in disgust when Bruce Buffer read the scores. He said he wants the rematch, which will be sure to be one of the company’s biggest sellers. The fight began with 10 inspectors from the Nevada Athletic Commission lined up across the middle of the cage to prevent the fighters from getting at one another, reminiscent of the 2002 heavyweight title boxing match between Lennox Lewis and Mike Tyson. They’ve developed that kind of a heated rivalry over the last five months, though nothing untoward happened. It was the kind of fight a main event of a pay-per-view show should be, as both man took and dealt out significant punishment. McGregor fought off several takedown attempts, because he was desperate not to go to the floor with Diaz and then have to risk being submitted again. Diaz took him down finally in the final 10 seconds, but it was too late. All three judges gave McGregor rounds one, two and four, but judge Glenn Trowbridge gave Diaz a 10-8 in the third to account for his score of 47-47. McGregor is supposed to defend his featherweight title next against Jose Aldo, but given the kind of battle he and Diaz put on, that defense may yet again be put on hold.